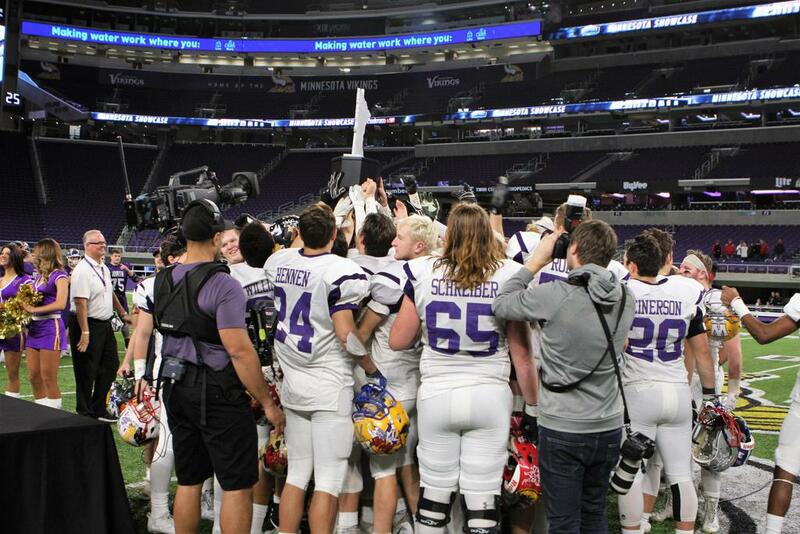 Ninety-two Minnesota seniors will compete in the Minnesota Football Coaches Association All-Star game on Saturday at U.S. Bank Stadium. The 1 p.m. game, the 57th such match-up dating back to 1945, caps three days of practice this week. The event is sponsored by the Minnesota Vikings and the coaches association. The game features players grouped into North and South teams. Last year the South All-Stars defeated the North All-Stars 28-14. North team players include running back Evan Hull of Maple Grove, quarterback David Roddy of Breck, wide receiver Treyton Welch of Buffalo, defensive back Omar Brown of Minneapolis North, and running back Parker Freiberg of Irondale. Roddy and Welch are finalists for the Mr. Football Award. Among the South team players are quarterback Cole Kramer and running back Jason Williamson, both of whom have verbally committed to Minnesota; offensive tackle Quinn Carroll, who has committed to Notre Dame, defensive back Matt Cavanagh of Edina, and tight end Will Mostaert of Lakeville North. Cavanagh and Williamson also are Mr. Football finalists. The South All-Stars lead the current North-South series 6-2. The South also leads the overall North-South series 14-10-1 through 25 games. The North team is coached by Kevin Feeney of Moorhead along with five assistants drawn from other northern-area schools. The South all-stars are led by Chad Clendening of Apple Valley and five assistants from south schools. The players and 12 participating coaches represent a record 89 schools. Player and coach selections were made by members of the coaches association. A youth football clinic will be held from 10 a.m. to 11 a.m. Saturday. Registration is free but limited to the first 500 participants. Register at www.vikings.com/showcase. * Performances from Minnesota high school drum lines, cheer teams and dance teams. * Minnesota Vikings Skol Line Performance. * Youth Madden Tournament beginning at 10 a.m. featuring 32 participants. * Madden 19 Vikings Club Championship from 10 a.m. to 1 p.m. in the Hyundai Club. About the game: The first all-Star game was played in 1945. It's been held annually since 1974. The game was played in a North vs. South format from 1945 through 1960 and from 1974 to 1979, a Metro vs. Outstate format from 1980 to 2010 and back to a North vs. South format in 2011 (to present). Through the years, over 4,500 players and 500 coaches have participated in this game. Ninety-four of those players have gone on to play or coach in the National Football League, including current Minnesota Vikings Adam Thielen (2008 All-Star), C.J. Ham (2011 All-Star), and Brandon Zylstra (2011 All-Star). For more information: Visit the Minnesota Football Showcase website and the MFCA All-Star Football website.